We will email you a unique tracking number, along with a link to the UPS tracking page, when your order is shipped. Note: It may take 2 Business Days before your tracking number will show up in the courier tracking system. If your shipment arrives damaged, inspect the condition of the goods before the courier driver leaves. 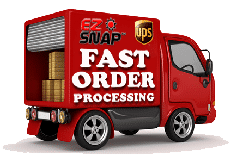 If there is damage or missing items, please notify EZ Snap, take photos, and email them to us immediately.